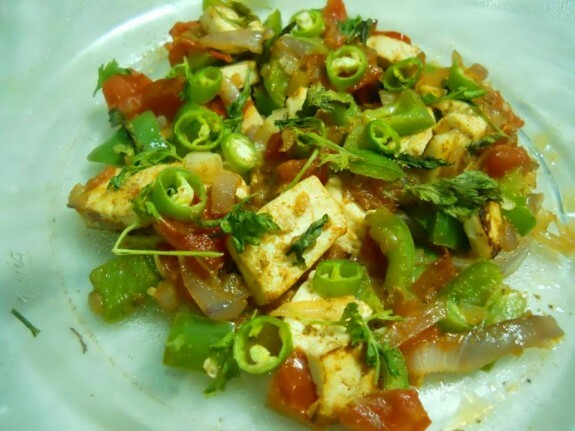 Toss through the paneer and other vegetables in a light oil and the salad will be all ready to go in a bowl. Make this recipe at home and keep yourself fit. Method: 1. Heat oil in a pan and add paneer. Fry it lightly in low heat. 2. Add chopped onions, capsicum and sauté it. Now add tomatoes and cook it until tomatoes become soften. 3. Now add salt, chopped green chillies and chopped coriander leaves. Mix it well. 4. Remove it from the heat. 5. Sprinkle some chaat masala powder over it and serve the paneer salad.